Back when I first moved to DC, I joined a book group that was more wine and gossip than it was book discussions. It eventually disbanded, and since then, I've listened with eager wistfulness as others describe their book group meetings. People talk of long, wine-fueled discussions about Camus and Jane Austen. A friend of our flies into DC every quarter to meet up with some old Oxford buddies and read sections of Plato's Republic. (I am not kidding.) And just last week, the director of a non-profit of which I'm a board member was telling me that his book group hosts dramatic play readings. I'm missing out! But the time I was most jealous of a book group was when my friend Rachel told me that at her last meeting, they served this for dessert: a big platter of cashew-scented mousse, topped with fresh figs and gratings of chocolate. (I think they may have swapped in strawberries.) I'm sorry, is it not painfully obvious that I am dying to be in a book club, for, you know, the book discussions and the food?? In other news: if anyone else is bookclubless and wants to start one up, give a shout. I'm on the market. Back at home, I decided that if I can't have the book club, at least I can have the cashew cream. So can you. This sounds like a bit of an out-there recipe, I know. But you'll have to trust me that it's easier than it sounds. Equally important: it is amazing. It doesn't sound easy. Oh, but it is. There's no cooking or baking involved, you need only one appliance, and you can make it well in advance. What on earth is cashew cream? It's a mousse that's made from soaked ground cashews. It's light and creamy and best of all, it's vegan (unless you don't want it to be). But still really delicious, says this butter lover. I don't have coconut/mango/lime in the house. No problem! Cashew cream goes really well with lots of things. You can top it with fresh strawberries or raspberries and grated dark chocolate. Or try blueberries and a drizzle of maple syrup. It's a bit of a blank slate, ready to play in the sandbox with whatever toppings you have on hand. The "summer means unfussy" mantra continues. Now, the question I have for you: do you think cashew cream would be good as a component to a savory dish? I'm thinking yes, but I haven't yet had the courage to try it out. When the weather is hot and sticky and you can't imagine even breezing past that oven, cashew cream has you covered. I figure if I bring this to the Plato book club, they'll never be able to turn me away. Put cashews in a large bowl, cover with water, and soak for 6 hours or overnight. Strain the soaked cashews, and put them in a blender or food processor with the scant cup water or milk, vanilla, salt, sugar or honey, and oil. Blend for about 2 minutes at high speed, until completely smooth. Don't shortchange the blending process; you want the cashew cream to be smooth and silky, without any coarse bits left. Taste and add more sugar or salt as needed. To serve, spread cashew cream onto the base of a pretty platter or bowl. 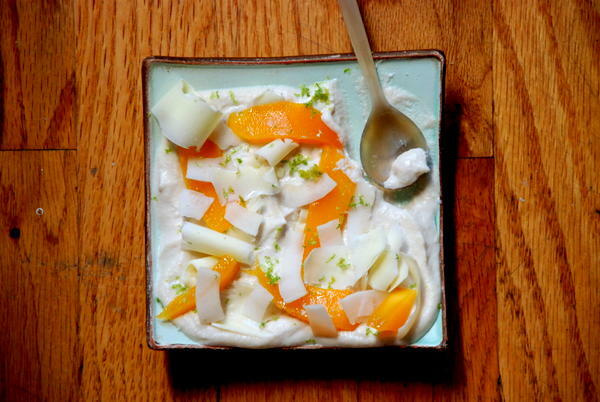 Arrange the fruit and coconut chips on top of the cashew cream, and finish with chocolate shavings and lime zest. Serve chilled or at room temperature.